We please to service, support and jar test the chemicals at your site. 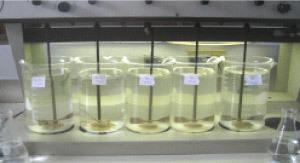 The jar test is a pilot-scale test of the treatment chemicals used in a particular water plant. It simulates the coagulation/flocculation process in a water treatment plant and helps operators determine if they are using the right amount of treatment chemicals, improves the plant's performance.